Apple's first watch was ... well, just a watch, actually. 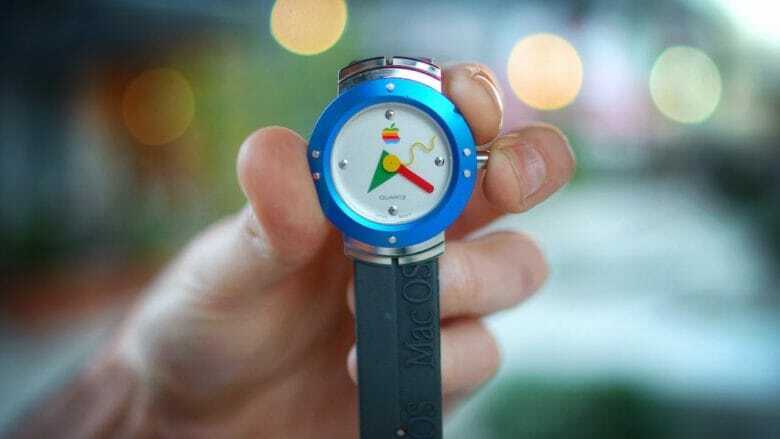 May 2, 1995: Apple enters the wearables space with its first watch, a timepiece with no fitness-tracking tech, no on-screen notifications and a whole lot of 1990s styling. The (real) first Apple watch comes two decades before wearables will become a thing. 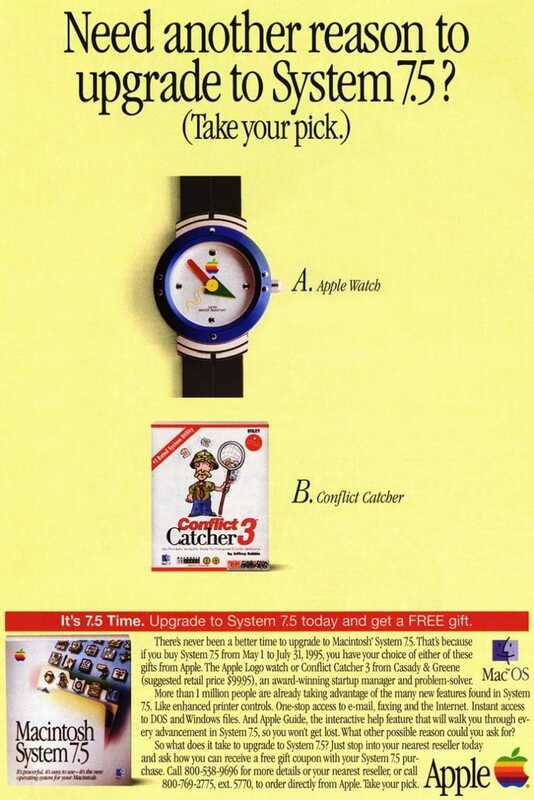 A regular wristwatch, the freebie gadget is available as a special mail-in offer to System 7.5 upgraders. The 1995 Apple watch existed to motivate Mac users to upgrade to System 7.5. At the time, System 7 was 4 years old, having debuted in May 1991. The 7.5 upgrade came preinstalled on new Macs (such as the Macintosh LC 580), but was only available as a paid upgrade for people who owned older Macs. System 7.5 did bring a few worthwhile upgrades, however. It packed more than 50 changes in all. Some of them were entirely new. Apple acquired some of the new Mac features from third-party devs, and ported others from the professional-level System 7 Pro. The biggest upgrade made it easier to connect your Mac to internet and email. Other nifty features included an Apple Guide, a smart “how to” manual that proved far superior to Apple’s previous Balloon Help feature. Did you take advantage of this offer back in 1995? System 7.5 came at a bad time for Apple. The company languished in its mid-1990s low period, promising innovations like a top-to-bottom Mac OS refresh called Copland that would remain tantalizingly out of reach. Apple’s position looked even starker when compared to the crazy levels of success Microsoft enjoyed with Windows 95. Today, the 1995 Apple watch is a nice collector’s piece. Expect to pay a few hundred dollars for one on eBay (although some folks will try to reap up to four figures). What’s your favorite Apple collector’s item? Have you got anything rare you want to brag about? Leave your comments in the box below.